Hidden away between Paignton and Brixham is Armchair Cove. I walked to it from a residential street, past a holiday camp, and under the railway line. Coming out from the tunnel it was like emerging into another world. A soft green clifftop with three bunnies hopping about, the odd parasol mushroom, and a pair of ravens perching in a tree. You don't realise the cove is there until you get to the end of the field. When I looked down I couldn't believe it. Turquoise clear sea, just what I was hoping for after the dreary wet weather, but which I hadn't expected. I swam into the lagoon and explored in and around the Armchair, fascinated by the fantastical rocks, which all seemed to have halloween-style faces. The sun came out and the sea was warm - 15.7 degrees - it hardly felt like the end of October. "It's like leaf snow" said Angie as the leaves fluttered gently from the sky as we swam. We were at the pool off Wellsfoot Island, below Holne Cliff, and the water had cleared since we swam there last week. The leaves were all around us, like little gold coins, falling above our heads, collecting in drifts on the surface, and sinking gently underwater. The water temperature has gone down about a degree - now at 11.8 degrees. My friend Judy swears the Dart gets warmer the nearer you get to its source. Today I had the opportunity to test this theory, with two swims, one at Spitchwick and one upstream at Sharrah Pool. It seems she is right, although an experiment on one random day is hardly very scientific. It was 13.2 at Spitchwick, and 13.7 at Sharrah, a difference of half a degree. However I'm not sure this as at all conclusive as the swim at Spitchwick was at 9am and the one at Sharrah was six hours later. At any rate, both swims were beautiful, as we glided around in great swirls of natural foam.. The water is much clearer now too, having been been variously like cocoa, Bovril and tea in the last couple of weeks. The Dart has gone from zero to hero - or perhaps the other way round - in a matter of days. 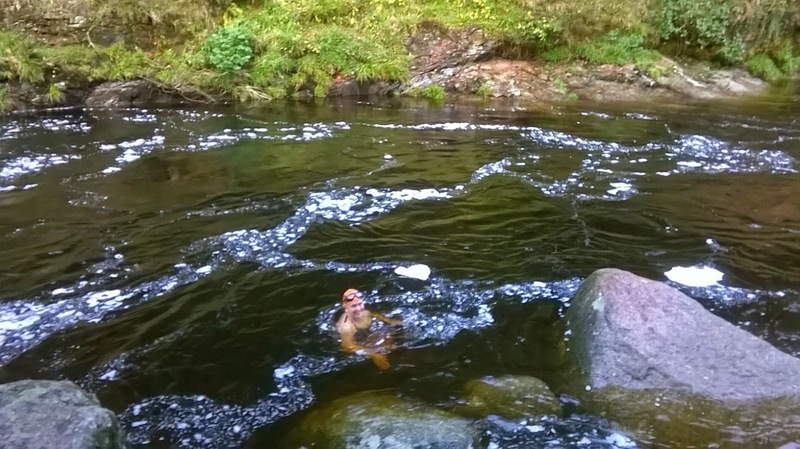 Just over a week ago we swam at Spitchwick; the temperature had plummetted to 11 degrees but the water was still the lowest it's been for a long time. Within 24 hours, after a night of heavy rain, it was completely unswimmable. Today, after more rain, it was like boiling Bovril, racing along and overtopping its banks. As the rain pelted down, we gathered at the big bend at Spitchwick, the only place remotely possible to swim, and created a 'changing room' out of umbrellas; Anna declared that umbrellas are the 'new thing' in winter swimming, and that she's giving up waterproof coats forthwith. We stood on the edge of the river, up to our ankles on granite slabs that are usually dry, and plunged into the brown water, which immediately froze our fingers. We hugged the bend as we whooshed round to the next exit, got out, and repeated the exercise. We all agreed that it wasn't the most pleasant swim ever, but 'honour had been satisfied'. maze of channels, gulleys and islands. In one inlet we found an iron ring concreted into the rock: perhaps this was a secret mooring spot? We felt a strong sense of stories of past lives hanging in the sea mist around this particular cove.